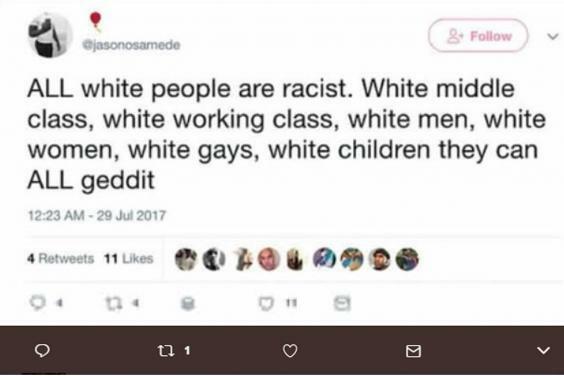 Head of Oxford university equality group claims all whites are racist. Isn't it racist to say that? Pretty sure that makes this Jason Osamede Okundaye a racist. The head of a Cambridge University equality group has appeared to claim “all white people are racist” after praising protesters who clashed with police in Dalston. 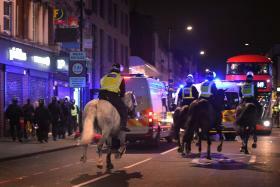 Jason Osamede Okundaye, who runs the Black and Minority Ethnic society, took to Twitter on Friday night after a protest over the death of Rashan Charles turned violent and police came under attack. Tweets sent from the 20-year-old student’s account encouraged the protesters and claimed white people had “colonised” Dalston. His account then posted a meme aimed at the protesters which said “you’re doing amazing sweetie”. The student at the prestigious university's Pembroke College has since made his account private after receiving a backlash over his comments. Violence erupts as angry Rashan Charles protesters clash with police. Riot police were called to Kingsland Street on Friday night after protesters blockaded the road and began lighting small fires. Dalston riot 2017. Another vintage year for North London. East London is in the news a lot at the moment, what with the acid attacks as well. I used to be round that place every weekend 3 years ago. I'm still not sure what this guy died of, I know he swallowed a bag, did he OD from the stash or something? The only statement i recall is the one saying he "fell ill", a quote I've heard on a few occasions connected with this type of incident.